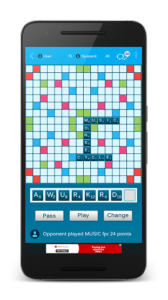 SmartFeud is a brand new word game for Apple and Android. We think it’s the best word game ever. And it is free! With SmartFeud you play a traditional word game that looks like the traditional games you know online with two, three or even four players. But it comes with a twist. A twist that makes the game much more exciting. When playing SmartFeud the most remarkable difference is the possibility to take one tile from the board, and use it to your own advantage. It’s easy. You are allowed to take any letter from the board, as long as at the end of your turn all words formed are in the dictionary. Just pick a letter from the board, and place it on the special place that is reserved for this purpose. Then use this letter to form a new word. 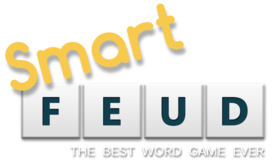 SmartFeud is the ultimate casual game. And of course you can chat with your opponents, invite your friends or play against a random opponent. Are you capable of beating your friends? Try SmartFeud now on your mobile phone, tablet or any other Android or Apple device.